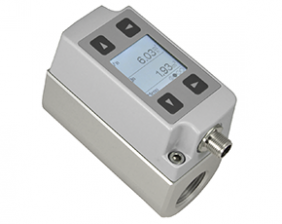 The flowmeter KME is dedicated for accurate metering and monitoring of compressed air and technical gases. For pipe diameters from DN15 (½") to DN 50 (2"), there are 2x mounting blocks available. The thermal measuring principle and the well-proven hot film sensor element lead to best long-term stability and fast response time. Outstanding measuring accuracy, even in the lower measuring range is achieved by an application-specific multi-point factory adjustment, which is performed at 7 bar. This allows reliable leak detection and corresponding energy savings. The construction is optimised for easy installation and maintenance. The KME is user configurable and can be easily adapted to any measuring task. The configuration can be set either using the optional display and push buttons or with the free configuration software.